Most of us out there don’t put enough thought into the socks we wear. We think any old pair will do. This way of thinking should be tossed aside with all the raggedy and mismatched socks in your drawer. When it comes to buying socks, there are a few different criteria you want to keep in mind. When you think about it, finding the best pair of socks is similar to finding the best men’s pajamas. In both cases, it all comes down to finding the right material, the price, the type of wear its designed for and any extra comfort features they might have. The history of socks is a history of practical need. Humans naturally sweat through their feet. It’s one of the places we tend to sweat the most. So, because humans are always trying to solve problems, we started wrapping cloth, hide, or fur around our feet to absorb the sweat and allow it to more easily evaporate. Not only are sweaty feet annoying but allowing that sweat to seep into your shoes wears them out quickly and degrades the quality of the shoes. Socks are perfect for keeping your feet comfortable and preserving your shoes for longer use. Those have been the two main functions of socks since we started wrapping fur around our feet. Even today, the effectiveness of socks is measured in large part by their ability to absorb sweat and keep your shoes from wearing out. In this modern age, it is also just as important to have socks that complement your style. The same goes for a wallet. Men are always looking for the one that will match their style, but without compromising functionality. Luckily, there are so many types of wallets today, so you don’t even have to choose between these criteria. There are now a wide variety of socks available for different functions. You want to make sure you aren’t wearing dress socks to go for a run. Here is an in-depth look at all the factors you’ll want to consider when upgrading your sock collection. We’ll also show you a few good examples of each type of sock available. We’re going to make sure you get the right fit at the right price. Any decent pair of socks does more than just absorb moisture. They distribute that moisture from the inside to the outside of the sock, in a process called wicking. Wicking is what keeps your feet dry and prevents odor-causing bacteria to stick to the sweat. You could also think of a sock’s wicking capabilities as its breathability. Padding is crucial for socks that are going to get a lot of use. Padding can be cushions on the sole to lessen the impact when walking or around the ankle and sides of the foot to prevent blisters. If a sock isn’t the right size, it will bunch up and move around. This is the biggest cause of blistering, so you want to make sure the sock hugs your ankle. This factor is important for dress styles. You want them to be a very thin material while still being sturdy. This allows them to slide into the dress shoes easily and not show through your pants. The color of your socks really comes down to you. Dress socks are traditionally black, but nowadays you can get a little more creative without getting dirty looks. If your style is to blend in, go with a color that compliments your overall outfit (and black compliments most things.) If you prefer to be bold and stand out, then pairs with a vibrant color or unique pattern can be a key part of your look. Don’t expect to find a sock that perfectly nails all those criteria in a way that suits you. If you do find that golden pair, don’t take it for granted. Buy a few backups. If you’re really not sure what color you should choose, you can always follow the rule of matching them with the color of your pants. Black socks are also a reliable option, but if the color contrasts too much with your pants, it will draw too much attention to your ankle and away from the rest of your outfit. Different occasions call for different socks. Athletic socks will not have the same fit and feel like a business or casual pairs. 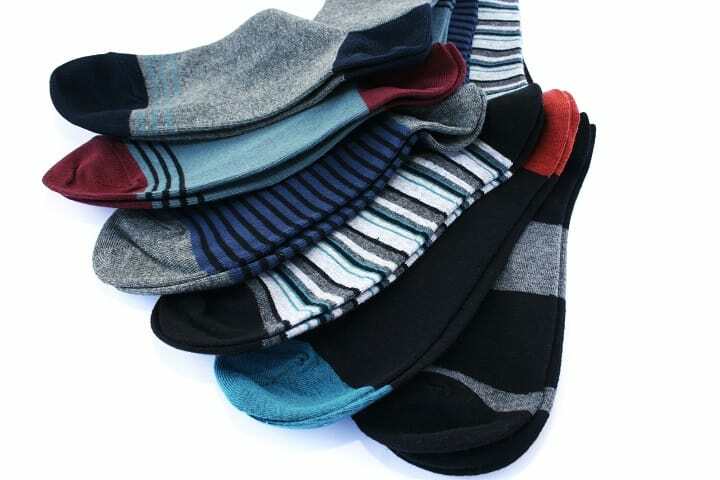 Here is a look at some of the most common types of socks and what features they each emphasize. Socks that fall under this category are multipurpose and typically generic. Think your basic white gym sock. They’ve usually got padding in the right places for comfort and reducing blisters. The best athletic socks boast their wicking capabilities and how well they keep your feet dry. Running socks can be slightly different from your basic athletic ones. The types designed for running are made of a thinner material that allows for even more wicking to keep your feet cool. They still have padding in critical spots to prevent blisters, but they are lightweight overall compared to other pairs. This is another subcategory of athletic socks, but they have thicker padding to stay comfortable for extended periods of walking. They are sometimes made of a thicker material overall, to protect your feet from cold weather conditions. Many pairs available are also water resistant, keeping your feet dry if you have to cross bodies of water. 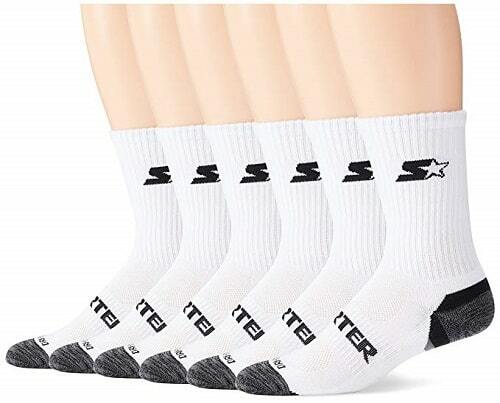 All these types of socks for athletic activities do share some common elements, and wicking is the most important factor to consider when looking at any type of athletic sock. After all, regardless of the activity, the pair you wear will need to absorb more sweat than the type worn for everyday use. Of course, there are also socks geared not towards vigorous activity but leisure, elegance or even just everyday wear. You can combine them with your best chukka boots because they look elegant and casual at the same time. 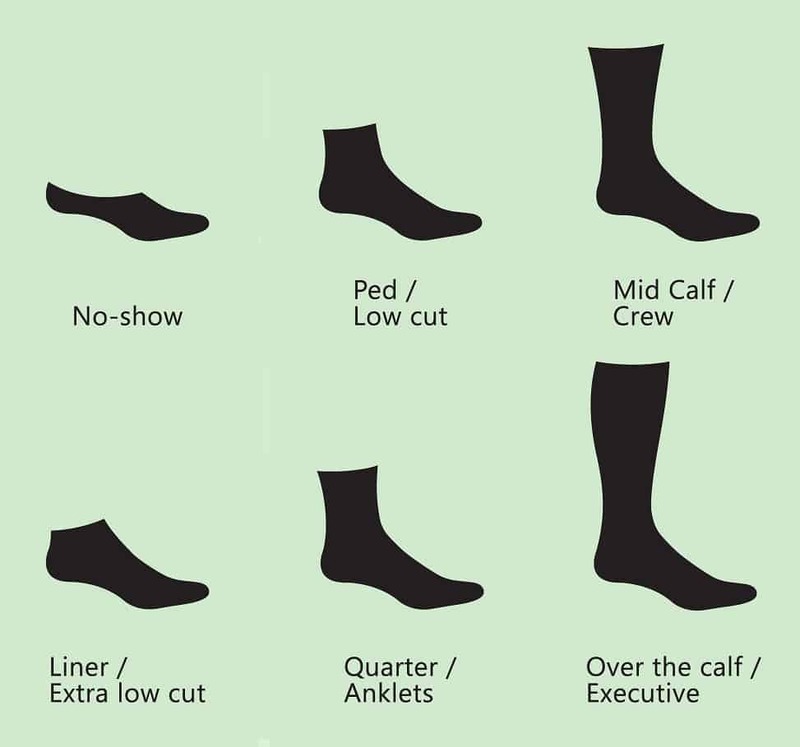 When it comes to dress socks, the look is usually more important than the extra features. A comfortable fit is important as well, so make sure you try them before you buy them. There is an endless variety of dress socks available these days. You can find all sorts of material used, from argyle to cotton to wool. You can also get almost any color you can think of, with black being the most common option. 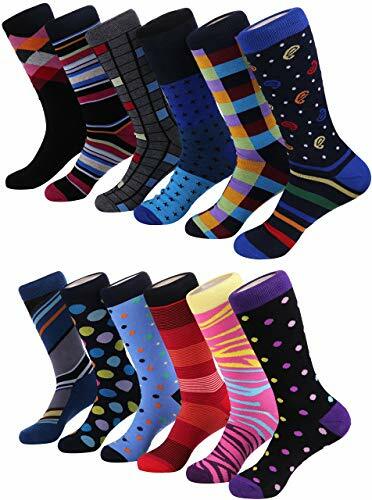 Patterns, as well as solid colors, are an option as well, so these kinds of socks are perfect for expressing your creativity. No pressure though. No one will think less of you for sticking to solid black. Unless you have brown shoes, of course. Then you should definitely avoid black. 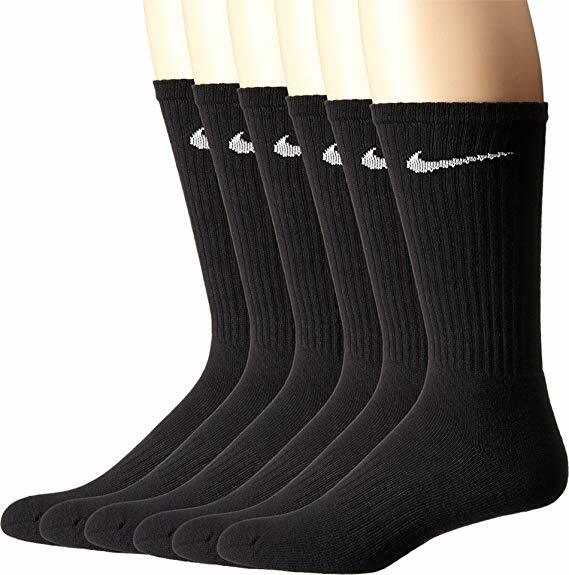 The most common form of casual socks nowadays are no show socks. They are designed with specific shoes in mind, like Sperry’s or Tom’s or Vans. They do not show past a certain point, because these types of shoes were meant to have a “no sock” look. These no-show pairs help you get the comfort and wicking you need without sacrificing your style. You can find them easily in the same place you would buy these shoes, so try to get those socks at the same time. Never settle when it comes to your clothes and grooming products. In order to get the best results, you should aim for the quality, which means you should always look for top beard grooming kits for your beard or the best toothpaste to get rid of bad breath. Just imagine what would happen yo your beard if you would use bad grooming products on it or how would your teeth look and feel like if your toothpaste would have some ingredients you’ve never even heard of. The same goes for any other clothing piece or grooming product. What separates a good pair of socks from a great pair? This is a combination of material used, price, color, comfort, and breathability. There is no exact answer and it ultimately comes down to your personal taste. Don’t just buy the first pair you see and don’t buy the cheapest pair you can find either. You will often find that socks on the lower end of the price scale often don’t hold up to extended use. They’ll get holes or stretch themselves out quicker than the pricier alternatives. Socks are one of the products where you will get your money’s worth, so don’t hesitate to splurge. Dress socks are where you have more specific guidelines to keep in mind, so here’s a basic rundown of the “rules” to follow. You typically want your dress pairs to come halfway up your calf, sometimes even right below the knee if that is comfortable for you. As long as they come up to your calf, you won’t expose any skin while sitting or crossing your legs. And it’s not that exposing your leg is particularly scandalous, but it does look strange to have your leg hair clearly visible during business meetings. There’s a certain code you should respect in these meetings and try to look your best. Not only your socks but also your clothes and hair should be top notch and look professionally styled. For this purpose, you can use your favorite pomade for men to sculpt and shape your hair in the desired manner. The length of the sock is where a lot of brands will try to cut costs, so if a pair is advertised as “calf length” you should always confirm and not just take their word for it. When looking for dress pairs, you should shop at specialized stores rather than Wal-Mart or Target. With an innovative moisture management technology, Dickies are go to socks for every man whose feet sweat a lot and who wants socks that don’t get smelly after wearing them the whole day. 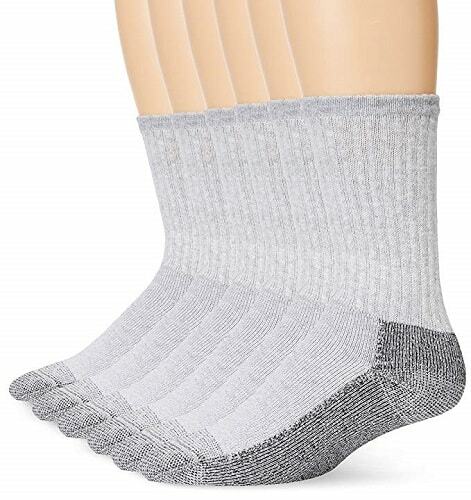 These are primarily athletic socks, so they are made to be extra comfortable. This is achieved with the thick cushion on heel and toe that makes them feel like they’re made of wool. Super soft cotton and polyester are two primary materials used in crafting this product. You can wash them in the washing machine, but note that they will stretch slightly after a few washes. Unlike some other athletic socks, these ones aren’t too tight at the ankle and fit really well. Another problem most men usually struggle is socks sliding down into their shoes, but that’s not the case with this model as it’s tall enough to cover the ankles and not cut into them. You get six pairs at a pretty low price, so they’ll last you for a while. 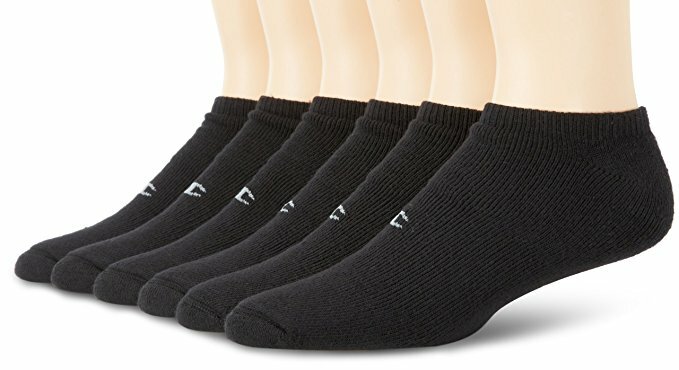 While a lot of other socks for men tend to stretch after a few washes, Starter Athletic Crew are nothing like that and will remain a great fit no matter how long you wear them. They are very durable thanks to the reinforced toes and heels and feel pretty soft and comfortable. Ventilated panels ensure that your feet breath well the whole time. There will be no moisture and sweat and your feet will remain cool and dry without smelling bad whatsoever. Knowing how important the arch support is, the manufacturer put cushioned footbed that ensures you feel comfortable at all times. For the same reason, there’s also a ribbed cuff that keeps the socks in place and doesn’t allow them to move around. The material from which the product is made is thin but soft. For the low price, you get a pack of six pairs, which, in the bottom line, is a bargain deal. With 76% of cotton, Nike Performance Cushion Crew prevent bad smell and sweating of your feet and they’re true to the size, as far as the fit is concerned. The toe and heel are reinforced to endure in high-wear areas and last for longer. Despite this, some buyers have noticed that they start ripping apart after some extensive amount of time. However, these socks don’t shrink or become tight after the washing. Besides the fact that they don’t stretch, they also aren’t too rough. This being said, you can conclude that there is an optimal amount of softness and comfort in them. Heels and toes are reinforced for increased comfort, while arch support and rib cuffs ensure a secure fit. A downside is that tops feel a bit tight, which might bother men who have problems with circulation or are forced to stand a lot through the day. For men who want their feet to stay cool and dry, Champion Double Dry Performance are the best as it gets when it comes to men’s socks. With the double dry moisture wicking technology, they prevent your feet from sweating too much and allow them to breathe. Even after washing them for more than dozens of times, they won’t fade or stretch. Just as any other product made of cotton, these socks will tighten a bit after you wash them. Because of this, if you have larger feet, it might be a good idea to look for other options on the market. If your feet are medium to small, order a larger size, so they fit you well even when they shrink slightly. Cushions and reinforced heel and toe will make sure that the socks feel comfortable and secure they don’t slip off your feet. Quality Lycra fabric from which Physix GeerCompression are crafted is what makes this product durable. It’s a good thing that this material is fully washable and doesn’t lose compression in the process. Being made of double stitched, anti-bacterial fabric, these socks won’t tear up that easy. 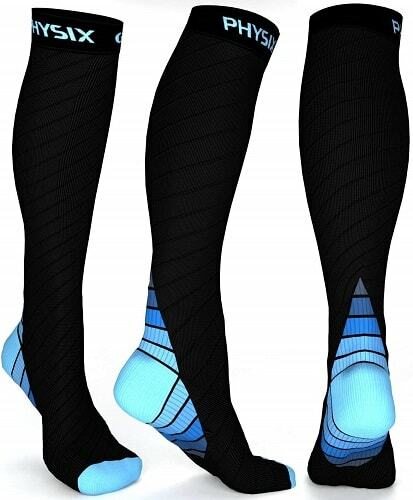 Unlike most other athletic socks, these are designed with gradient compression located on heels, foot, calves and toes areas. Therefore, they provide instant relief of varicose veins, reduce fatigue and swelling of your legs. This compression boosts your circulation and oxygen blood flow, helping your feet feel comfortable and recover faster after standing for an extended period of time. Additionally, this product has moisture-wicking properties, so it prevents your feet from sweating. Classy and colorful at the same time, Marino Funky have a perfect thickness. They are neither too thin, nor too thick and are also very comfortable. The size fits perfectly, so you can safely go for your usual size. A balance between softness and elasticity is achieved with a combination of 80% cotton, 10% spandex and 10% polyester. Designed to keep your feet sweat free and dry at all times, these socks are very breathable. You can rest assured that your feet won’t smell bad after taking them off. As far as the cleaning is concerned, you can safely wash them in a washing machine. For the best results, make sure to wash them with colored laundry and tumble dry medium. Unlike other socks, these won’t fall down your leg. They also don’t go all the way up to your knee and don’t feel too tight. The price is a bit higher, but because you get 12 pairs inside the pack, this is completely justified. Going perfectly with your working shoes and boots, Fruit of the Loom have a durable, reinforced sole, while the fully cushioned design provides a softer landing. A blend of cotton and polyester is what makes this product soft and allow it to feel comfortable on your feet the whole day. Even the toughest odors don’t stand a chance against the antimicrobial properties of these socks. This means you don’t need to change them the whole day. You can wash them in the washing machine and they will remain soft. Because one of the materials used to craft them is spandex, these men socks will adjust perfectly to the contours of your feet. This makes them fit as expected if your shoe size is in the range from 6 to 12. More on the pricier side, these socks come in 6 pairs per package. You already know that socks come in a variety of materials. But what is the difference, and why should you buy wool over cotton? And what’s the deal with synthetic materials? Cotton is the basic option and it has good absorbency. 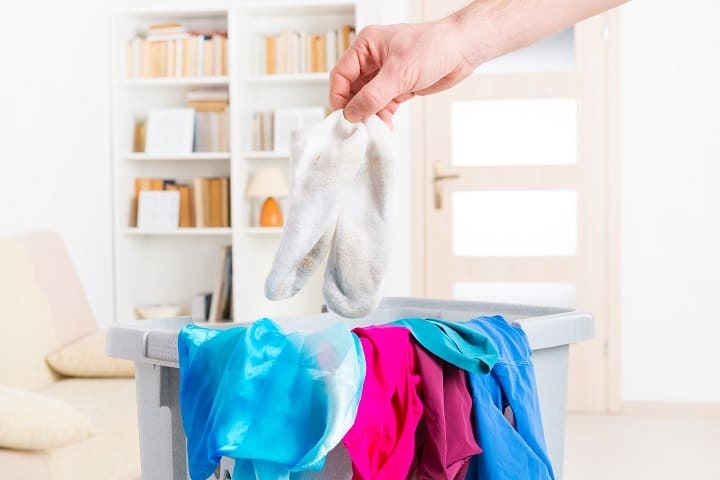 Its wicking capability is limited, however, which is why your old white cotton pair will often end up smelling bad after a while. Wool breathes a little easier than cotton and is better at keeping your feet warm. It’s also a lot bulkier, and its wicking properties are also limited. Basically, wool is not recommended for a strenuous activity where you’ll be doing a lot of sweating. Manufacturers have relied more and more on synthetic materials, and for good reason. They actually have the best wicking capabilities and are often much cheaper to make. 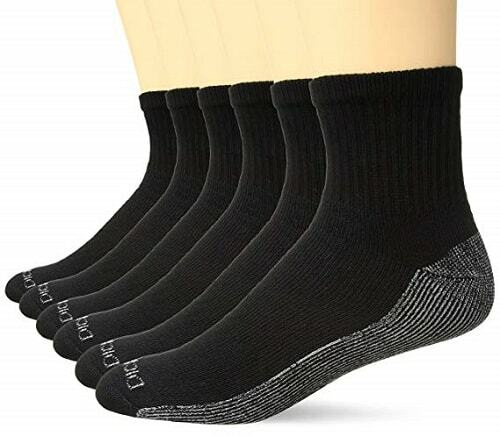 The synthetic materials have little to offer in the way of comfort or padding, so most times socks will be a wool or cotton blend to provide breathability in the right areas and cushioning in the others. If you’re serious about maintaining your socks and keeping them looking good and feeling good, there are specific ways to make that happen. When it comes to washing them, it is recommended that you wash at a cold setting and a gentle cycle. Because they are small compared to other clothing items, it doesn’t take a lot of power to keep them clean. If you wash them with your thicker clothes on higher settings, your socks might end up getting beat up or torn up in the wash. Always avoid bleach unless you are washing white socks. Nothing causes the color to fade faster than bleach. If your socks are a vibrant color, you want them to stay vibrant for more than a few washes. To dry them, you should also use a low heat setting, or just lay them out to dry on their own. Basically, washing socks come down to doing it gently in order to prevent stretching or tearing. The ultimate struggle with socks is to keep pairs together, especially after an extended period of time. Washing machines tend to inexplicably eat our socks, and the best way to prevent this is to match your pairs straight out of the dryer. That limits the places they could be hiding. Also, don’t forget to check behind or between your machines. Never-ending Debate – Socks or No Socks? We touched briefly on the idea of no-show socks, but why bother buying them at all? Why just not wear socks at all if you’re going for that sockless look? The biggest argument in favor of forgoing socks has to do with style. The fashion these days, excluding professional settings is to show as little sock as possible. This is easy if you aren’t wearing any at all. Wearing socks might not look cool, but the benefits far outweigh the fashion faux pas. This is similar to when dealing with dandruff. You might not like shampoos that can help you deal with this problem, but you know that washing your hair with natural anti-dandruff shampoos is the only solution to get rid of this stubborn problem. It’s similar to wearing socks. Wearing shoes without socks, most noticeably, leads to your feet smelling pretty bad. It won’t matter how you look if people have a hard time breathing around you. The other benefit is avoiding blisters. If you walk around in shoes all day without socks, you’re almost guaranteed to blister your ankles or the sides of your foot. Eventually, yes, this will lead to calluses. So if you want to go for the no-sock look, make sure you commit. And maybe get some deodorizer for your feet. Photos from: ruzanna / depositphotos.com, Lazuin.gmail.com / depositphotos.com, belchonock / depositphotos.com, Amaviael / depositphotos.com.